René Descartes (1596-1650) - Since the Fall of the Roman Empire in the West, philosophical thought in Europe had largely disappeared, except within the context of Christianity (i.e. Aquinas). Throughout the Middle Ages, it was left mostly to the Islamic scholars to build upon the work of the ancient Greek philosophers. All that changed in the early 17th century with the advent of the era known as "Rationalism", followed shortly thereafter by the "Age of Enlightenment". At the forefront of this period was René Descartes. One of the most famous thinkers of the early modern era, Descartes is, in fact, usually considered the "Father of Modern Philosophy" (he was also a mathematician), and many of those who followed base their work on his. He was a Frenchman, but lived much of his life in the Netherlands. Like Richelieu, he had planned to make a career in the military and joined the army of Breda in 1618 (ironically, he was as the siege of La Rochelle in 1627 which had been ordered by Richelieu). Once in the military however, he began studying engineering principles and turned his attention toward the sciences. Then in November 1619, Descartes supposedly had three dreams (or visions) which he interpreted as a guide to pursue a scientific method that would bridge the gap between math and philosophy. From that point on he decided to dedicate his career to scientific knowledge in order to reconcile these two disciplines. It was shortly after this time that he came up with his famous quote, "I think, therefore I am" (Cogito ergo sum in Latin) which has since become one of the most quoted lines ever. His first major work was Rules for the Direction of the Mind (Regulae ad Directionem Ingenii) which he began around 1622; but abandoned in 1628. It was his approach to tackling the problem he set out to solve. While he never quite accomplished his goal (if it is even possible), there's no question that he made giant advances in both the fields of math and philosophy. He developed a new geometry (Cartesian, named for him) which uses algebraic equations to explain it. And his work Meditations on First Philosophy is so influential that it remains a standard text in contemporary philosophy courses on western college campuses to this day. It should be noted that Blaise Pascal, another philosophical giant (and Frenchman), who was a contemporary of Descartes, opposed many of his views and wrote as much in some of his works. 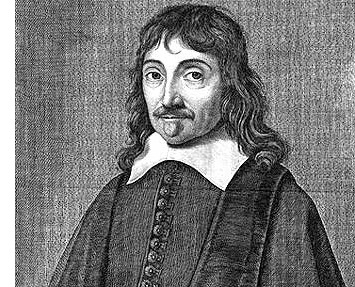 Although Descartes was a devout Catholic, Plascal claimed he dismisses God in his philosophical thought. He wrote, "...in all his philosophy, Descartes did his best to dispense with God. But Descartes could not avoid prodding God to set the world in motion with a snap of his lordy fingers; after that, he has no more use for God."